We received a very large number of very impressive entries in the adult division of the second art contest at The Norse Mythology Blog. Talented artists sent in wonderful works from Australia, Denmark, France, Germany, Greece, Italy, Mexico, Netherlands, Poland, Sweden, the UK and the USA. 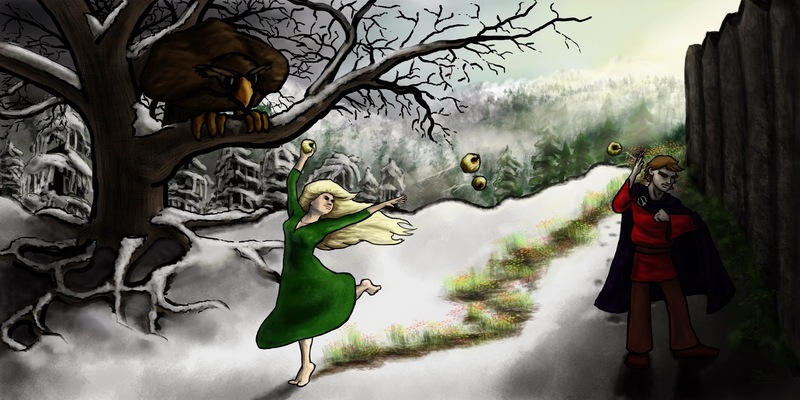 The theme of the contest was midwinter, and there was an amazing variety of approaches that incorporated Norse mythology and folklore in very creative ways. There were so many pieces that were so good, ranking was quite difficult for the judging panel – myself, Anker Eli Petersen (internationally known for his wonderful Faroe Islands postage stamps based on the Norse myths) and Erik Evensen (author/artist of the wonderful Gods of Asgard graphic novel). Each of the judges ranked the submissions individually, without knowing how the other two judges had ordered the works. The winners were determined by the adding the scores from all three judges. Since there was such a great number of strong entries, I decided to do something a little different in the adult category. I am posting not only the three winners, but also the three pieces with the next highest scores. These works are so good, everyone really should see them! If you haven't checked out the winners in the other age divisions, click here for the kid winners and here for the teen winners. Congratulations to all who won, thanks to everyone who entered, and hails to the judges for their work. Stay tuned for the Midsummer Art Contest in 2014! Kamil writes, "I have portrayed Odin taking a break from travel to Midgard. A giant Yule Goat shelters him from snow and wind. The god is smoking a long pipe looking at the flames of a crackling fire on a thick log (Yule log). I have also included a group of curious huldufólk (dwarves or elves) lured in by fire or jingling bells." Anker Eli calls this "a fantastic picture." Erik writes, "I love the firelight on this and the design of the goat, and the aurora in the sky is a nice touch." I am hypnotized by Kamil's work. Everything about it is magical – the warm light from the fire, the peacefulness of Odin, the curiosity of the Yule Goat, the sneakiness of the dwarves, the coldness of the snow, and the glow of the Northern Lights. This is such a beautiful representation of the midwinter moment! Eleanor explains her work: "This painting is one of a polyptych of nine panels. 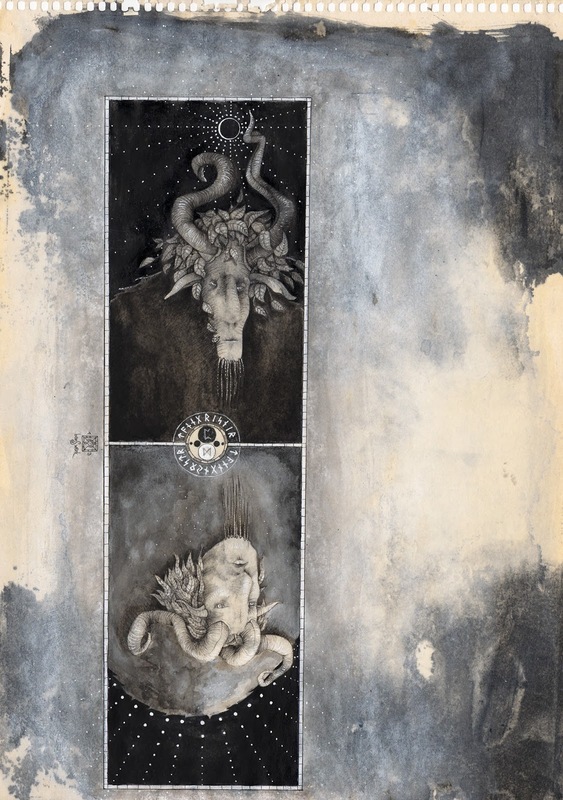 They are all large scale (4'x 4') and done in oil on wooden boards; they depict various scenes from the Norse myths. The specific one I would like to enter is an image of the Allfather in his guise as the wanderer. The paintings are meant to symbolize a cycle of death and life. With my depiction of Odin, I wanted to evoke the energy of midwinter and Yule, of darkness and mystery and midnight. He is flanked by Huginn and Muninn and carries in his hand a goblet full of sparkling mead; the dead branches around him are that of the Ash tree and he draws in the ground the rune Isa which is associated with stillness, balance and cold." 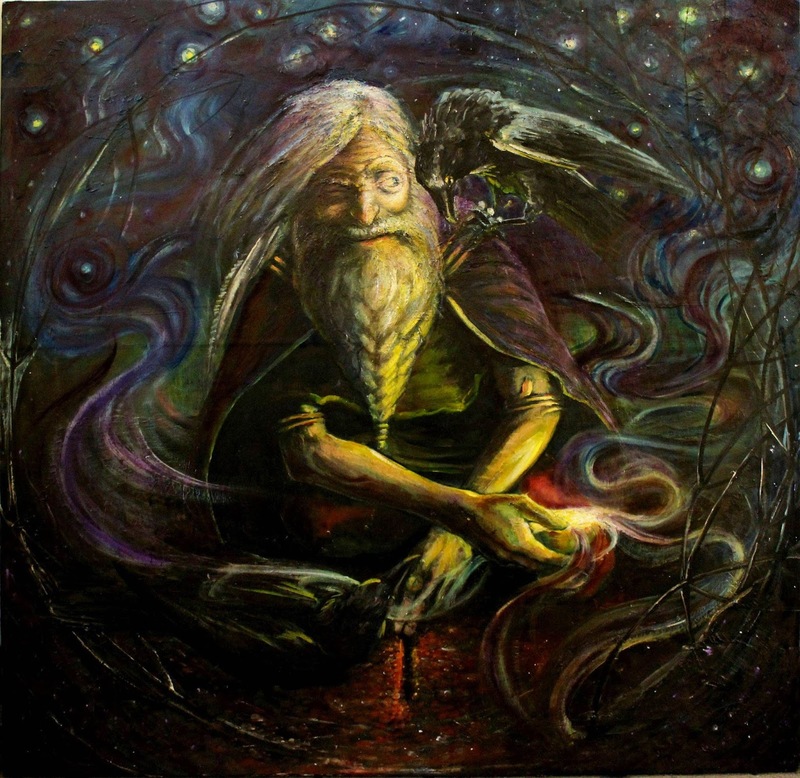 Anker Eli says that this is "a wonderful presentation of Odin and his features," and Erik says that the "creepy looking Odin" is "well rendered and composed." I love the look on Odin's face. What exactly is the raven whispering in his ear? In the Icelandic sagas, midwinter can be a very spooky time. Eleanor has perfectly captured the dark secrets of the longest nights of the year. Tokubi describes his painting: "The jotun-goddess Skaði brings winter to a city. In the distance, a storm is brewing." Erik says, "I love the concept of the arrow casting winter over a landscape." 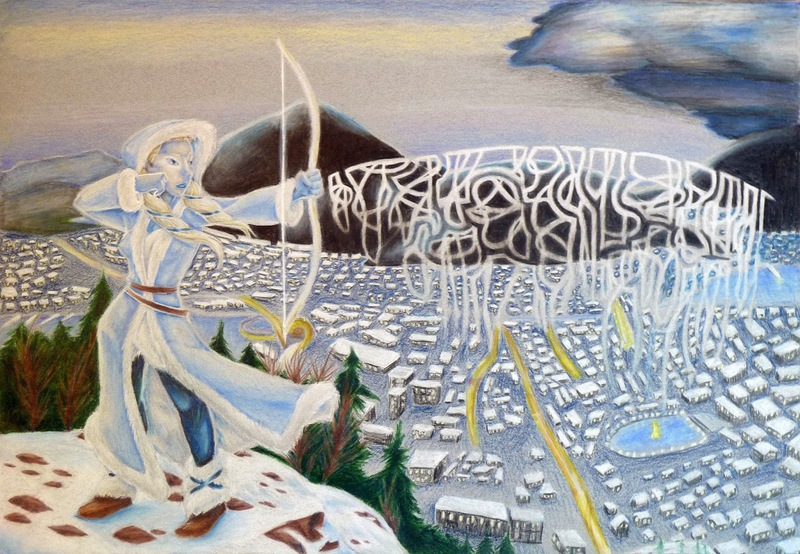 Anker Eli says, "I can relate to this depiction of Skaði shooting the winter in." I absolutely love Tokubi's characterization of Skaði; the strong-willed ice-maiden is the symbol of my website, after all! The image of her arrow's path turning into snow is both delicately beautiful and wonderfully mystical. Susanne writes that this piece is of "the Yule-Goats Tanngrisnir and Tanngnjóstr as an allegory for the vanishing darkness and incoming light." Erik says, "Susanne's piece has some beautifully rendered goat heads full of mood and character, with a textural, abstract expressionistic composition." What an original and creative approach! 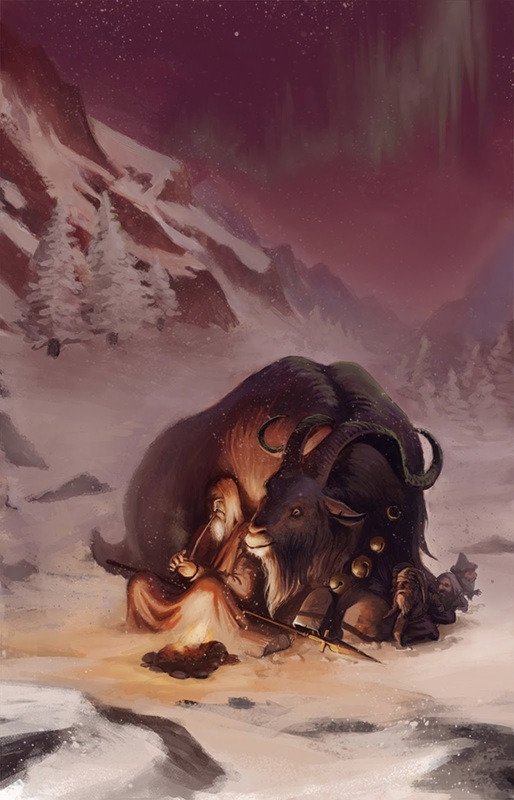 The connection of Thor's goats with the Yule Goat is very interesting, as is the imagery of darkness and light. I love the haunting, otherworldly quality of the character design, and the background perfectly evokes the short, snowy days of midwinter while hearkening to the monumental work of the great German artist Anselm Kiefer. This is a work of great power and weight. Sam describes his painting: "The spirits of Yule gather to discuss how the town will be treated. Odin and Holle observe that the town has set up the Yule Goat and follows the old ways. 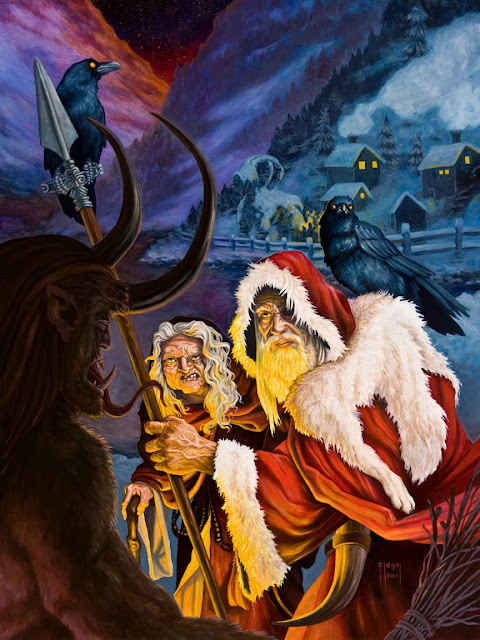 They warn Krampus to not be too harsh on the town, as they plan to give it a proper Yule blessing." Anker Eli calls this "a great picture" and Erik says it is "beautifully rendered; it looks like a book cover." In this technically accomplished work, Sam manages to bring together characters and imagery from a wide range of sources into an interesting (and clever) narrative moment. Wonderful! Carl gives a detailed background for his entry: "I gave a paper in 2011 on a version of this myth as a harvest poem, rather than a midwinter poem, but all the reasons that the skald Þjóðólfr found the myth productive for a harvest poem also recommend it for a Midwinter poem, as the theft of the fertility goddess Iðunn brings youth and springtime bounty to the giants, while the gods are left to grow old and grey. Given that, I decided that my Midwinter picture would also draw on the myth of the abduction of Iðunn as a way of dramatizing the coming of winter – the land of the giants, behind our giant-transmographied-to-eagle, is cold and snowy, typical given the association of the giants with inhospitable rocks and mountains in many of the myths, but the cold of those mountain tops (a giantish association that is hit on a few times in the poem) will soon be transferred to the land of the gods, behind their imposing wall (shown on the right with Loki in the shadows), as Iðunn’s powers and her life-giving apples (here shown golden[-ish], as seems to be indicated elsewhere in the mythic corpus) transform those wintry mountaintops into eternal Spring." Anker Eli was very impressed by the thought behind this work: "Carl has captured what I think is one of the most important features about Midwinter – the transition from one year-cycle to the next, the myth about Iðunn's apples and the kidnapping of Iðunn (the cosmic order) by the giant in shape of an eagle (the moment of chaos between to cosmic cycles)." Erik says, "This is one of my favorite myths! I dig the character design of Idunn and Loki." I was actually present when Carl gave the paper he mentions at the Society for the Advancement of Scandinavian Study conference in Chicago. The paper was brilliant, and I absolutely love how Carl is able to transform his deep academic work into wonderfully charming visual imagery. He's a gifted scholar and artist; check out his writing and artwork at his fantastic website, Vikings, Books, Etc. Norse mythologists of the world, unite! Excellent work done by all!!! All of the work was so beautiful. I can't stop going back to look at the Winner over all. It is just so warm. I'd get a print of the winner's art if I could, very nice.